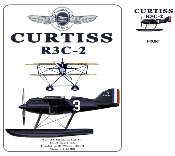 Classic Air Race aircraft and winner of the 1925 Schneider Trophy. Piloted by Jimmy Doolittle with a winning speed of 232 mph. Small crest on front, large design on back. One-sided design has large image on front, nothing on the back. Available as a T-shirt or a Sweatshirt. Available in White, Natural and Ash Grey.